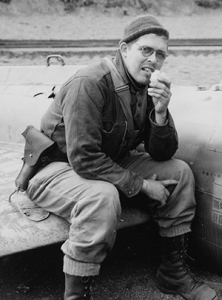 Sergeant George F. Noland. U.S. Army Photo. Six months after their surprise attack on Pearl Harbor, the Japanese military expanded its control into the north Pacific. In June 1942, they launched an air raid against the U.S. naval base at Dutch Harbor, Alaska, and then landed troops on the islands of Kiska and Attu at the far end of the Aleutians. Concerned that Japan might use these islands to launch air raids against the Pacific Northwest, especially targeting the Boeing bomber plant and Bremerton Navy Yard in Seattle, the United States Army was sent to fight both enemy forces and the harsh Arctic environment in an effort to retake the Aleutian Islands. This difficult assignment was given to the newly reformed 7th Infantry Division. 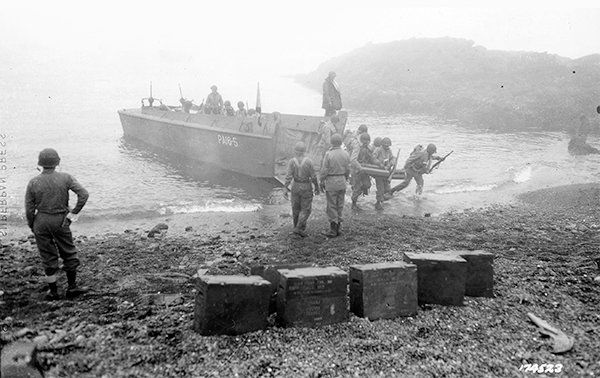 Completing its desert training at Fort Ord, Calif., in preparation for deployment to North Africa, the division quickly changed to amphibious assault training for the Aleutian Islands Campaign instead. In early May 1943, more than 15,000 Soldiers arrived in Alaska aboard ships in preparation for Operation Landcrab, the landing on Attu Island at the far end of the Aleutian chain. This would be the only battle of World War II fought on American soil. Among the Soldiers who landed that day was 25-year-old Technician 4th Class George F. Noland of the U.S. Army’s Signal Corps. Having graduated high school in 1936, Noland apprenticed as a photographer in Minneapolis before being drafted into the Army in 1941. He initially went through infantry training but once his special talents were recognized, he was diverted to the Signal Corps school to become a combat photographer. In early 1942, Noland was assigned to the headquarters staff of the Alaskan Defense Command, commanded by the indomitable Major General Simon B. Buckner, and completed his first photographic assignment documenting the construction of the Alaska-Canada Highway by the Corps of Engineers. Then in early 1943 he was ordered to join the 7th Division for their assault on Attu Island. Landing barge at Red Beach. Photo by Sergeant George F. Noland. On the morning of May 11, 1943, Noland later recalled, they waited in the cold fog as the LCVPs (Landing Crafts, Vehicle, Personnel) were loaded. “We had our victory dinner and cake 48 hours previously, so we were on K rations before the landing,” he explained. “We had our boat assignment and were just waiting for the order. Then came the order: ‘Assault wave, man your boats! Lower boats! Away all boats, away!’ With tongue in cheek, I scrambled aboard.” Armed with a camera, Noland went ashore with some of the first waves on the northeastern end of the wind-swept island and spent the next two weeks documenting the 7th Infantry Division’s advance. Every Soldier, like Sergeant Noland, has a story to tell. Fortunately, with the National Museum of the U.S. Army, their important stories will have a place to be preserved and retold, so that their acts of bravery and sacrifice will not be forgotten.